1978-1980 Master of Fine Arts Rutgers University, Mason Gross School of the Arts. 1974-1978 Bachelor of Arts, in Visual Arts (visual art) Rutgers University, Rutgers College, with departmental honors. Researcher: From Oct 2010 to present. Investigating the application and theory of Information Visualization and 3D on the web technologies (WebGL/X3DOM) for a variety of scientific applications, within the High Performance Computing and Visualization Group of the Mathematics and Applied Computation Division. Program Manager: From Oct 2006 to Oct 2010, Complex Systems program responsible for a portfolio of projects totally approximatly $2.5M/year. Developed vision plans and oversee execution of projects dealing with complex systems. Complex systems are those types of systems in which large numbers of similar entities exhibit some type of macroscopic behavior that can not be predicted simply by looking at the individual entities. Application domains are currently primarily Networking oriented, future applications will involve biological systems, nanotechnology, complex engineering as opportunities arise. Project Supervisor: Visualization and Virtual Reality (VVR) project obtaining funding between $500-750K/year for over 10 years. Responsible for planning, management of a staff of 3-5, and most of the technical design work of the project. Created the Open Virtual Reality Testbed. I created the testbed, obtained funding and have received a fair amount of publicity due to a collection world wide web pages I maintain. I was also a principle technical staff member in the initiation and development of a NIST wide "Virtual Library" project which seeks to bring the information resources of the NIST library to staff members desks. Also active in a variety of manufacturing standards efforts. I have also been active in obtaining several cooperative research agreements between outside industry and NIST. Participant in a number of other projects including: A graphical tool to generate 2D tilings for research sponsored by the Bureau of Engraving and Printing; Visual display of control systems; Implementation of a shape grammar for stylistic analysis of an artist; Development of object oriented data base systems for use in data representation; and Systems programmer for a sizable network of Sun's, and Silicon Graphics Iris's. Web3D Consortium: Vice President (99-01) and Member of Board of Directors (99-06), active in the H-ANIM (Humanoid Animation) working group and founded the Medical Working Group, leading successful effort to obtain grant funding for the consortium. About.com: 3D Graphics/Virtual Reality Guide running what was, during its existance, the most popular web site (Article Archives) for information about VRML and other 3D Web technologies. From October 1997 to June 2002 I wrote a weekly feature article (194 total) for the site, and provided links to hundreds of information sources, tutorials, and examples. In addition to writing I hosted weekly chats sometimes with noted guests. The site was internationally recognized and was generally considered a "must see" web site for obtaining the latest news and information on the Web3D field. Navigation Sciences: Responsible for the specification, procurement, and installation of a VAX 730 based software development system. This included budgeting and justification of the system. An Ethernet was installed between several IBM PC's and the VAX which was running UNIX 4.2. Software was to be developed on the PC's with support data bases and other tools on the VAX. Additionally graphics software for the PC's was reviewed and selected for the development of a PC bases navigation system with integrated nautical charts. Videomagic Laboratories: Part of a software group that designed and implemented a real time surrogate travel system using video disks, overlay graphics, audio with digitized speech and digital data from the video disk. The project was for a video disk based arcade game. All the work was done in C on 68000 based development systems and later downloaded to a 68000 S100 based run time system. Responsibility in the integrated system included: designing and implementing real time graphics code and a data base system which was a mechanism for describing animations. Also served as the "unofficial" systems person responsible for the maintenance of 5 UNIX machines. Supervised part-time personnel and consultants who worked on systems tasks. Responsible for producing a prototype film which functioned as a testbed for the surrogate travel software, including budgeting and hiring outside production staff. 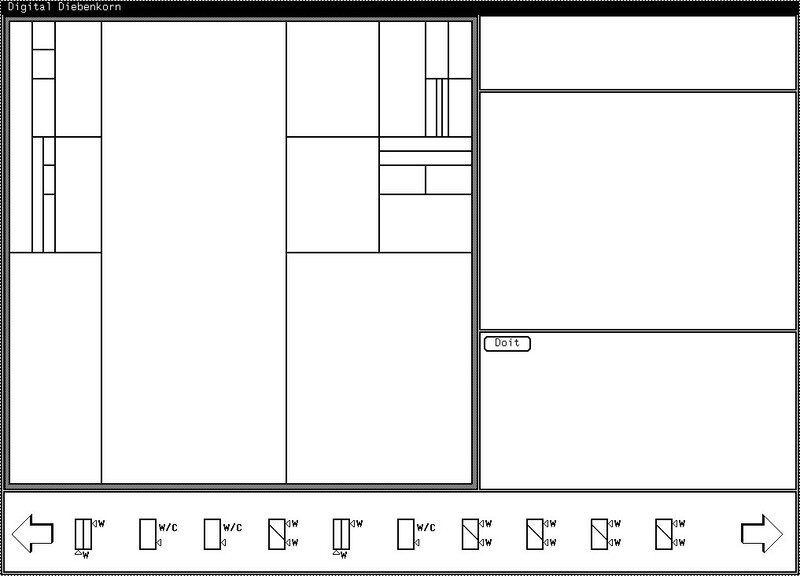 Carnegie Mellon University: Designed and implemented (Pascal) an interactive graphics system which allowed teachers to produce illustrations and animations using an IBM PC. 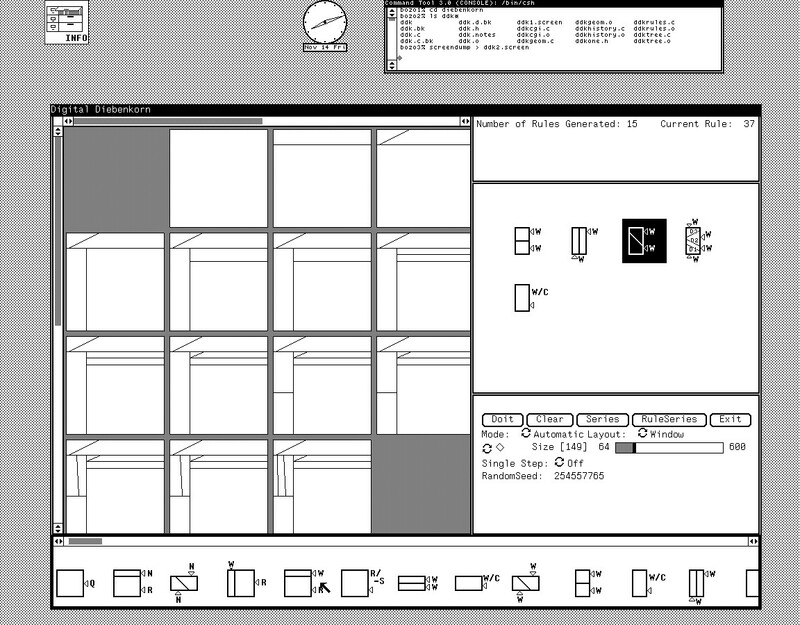 The system was a combination of a paint system with animation capabilities. This software later became part of a start-up company delivering educational and training systems. Sandy Ressler, Kyle Leber, "Web Based 3D Visualization and Interaction for Whole Body Laser Scans" in Proceedings of the 4th International Conference on 3D Body Scanning Technologies, Long Beach CA, USA, Nov. 19-20, 2013. Sandy Ressler Web-based Declarative 3D Graphics for Anthropometry Visualization and Education" in Proceedings of the The Graphical Web 2012, Zurich, Switzerland, Sept. 11-14, 2012. Qiming Wang, Bonita Saunders, Sandy Ressler Dissemination of 3D Visualizations of Complex Function Data for the NIST Digital Library of Mathematical Functions in Data Science Journal, Vol. 6 (2007). Afzal Godil, Sandy Resler, Retrieval and Clustering from a 3D Human Database Based on Body and Head Shape in Proceedings of 2006 Digital Human Modeling for Design and Engineering, July 2006, Lyon France. R. Mollard, S. Ressler, K. Robinette Database contents, structure, and ontology for WEAR in proceedings of IEA2006: 16th World Congress on Ergonomics, July 10-14, 2006, Maastricht, The Netherlands. Qiming Wang, Sandy Ressler A Tool Kit to Generate 3D Animated CAESAR Bodies in proceedings of Digital Human Modeling for Design and Engineering (DHM), June 14-16, 2005, Iowa City, Iowa. Afzal Godil, Patrick Grother, Sandy Ressler Human Identification from Body Shape in 4th International Conference on 3D Digital Imaging and Modeling, Oct 6-10 2003, Banff, Canada. Sandy Ressler, Qiming Wang Using Web3D Technologies to Visualize and Analyze Caesar Datain proceeding of XVth Triennial Congress International Ergonomics Association (IEA 2003) Aug 24-29, Seoul, Korea. 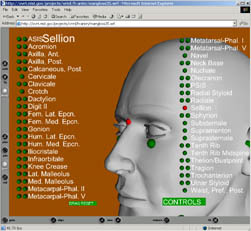 Sandy Ressler, Qiming Wang A Web3D Based CAESAR Viewer in Proceedings of Computer Assisted Radiology and Surgery (CARS) 2002 - H.U. Lemke, M.W. Vannier; K. Inamura, A.G. Farman, K. Doi & J.H.C. Reiber (Editors) CARS/Springer. Sandy Ressler, Brian Antonishek, Qiming Wang, Afzal Godil, Keith Stouffer, When Worlds Collide - Interactions between the Virtual and the Real Proceedings on 15th Twente Workshop on Language Technology; Interactions in Virtual Worlds, Enschede, The Netherlands, May 19-21, 1999. 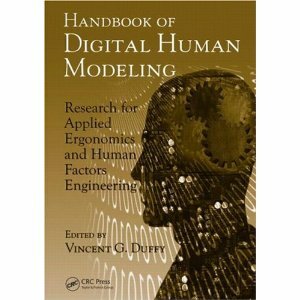 Sandy Ressler, Qiming Wang "Integrating Factory Floor and Human Simulation in a Portable Web-Based Environment" in Proceedings of Human Factors and Ergonomics Society European Chapter 1997, Bochum Germany, Nov 6-8, 1997. 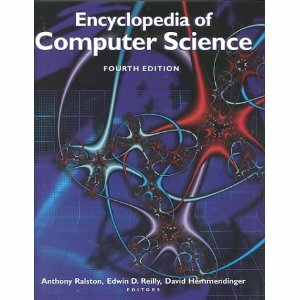 Sandy Ressler, Bill Trefzger "Development of the NIST Virtual Library" IEEE Internet Computing Vol . 1, No. 5, Sept-Oct 97, pg 35-41. "Experiences with Heterogeneous-Platform CD-ROM's," Proceedings of the Advanced Information Interfaces: Making Data Accessible Conference, June, 1991. Network Based Documents (PDF) chapter in OII Spectrum Management Handbook, Technology Appraisals, 1995. Towards Intelligent Document Processing - from batch to WYSIWYG and beyond, OII Spectrum Vol. 1, No. 5, Feb. 1994. Contributor to: Virtual Reality Assessment - A Report of the Task Group on Virtual Reality to the HPCCIT Subcommittee of the NSTC. April 1994. U.S. VR Policy Raises Concerns, Real Time Graphics, Vol 2, No. 3, Sept. 1993. Battele Seattle Group Paper on Graphic Input Interaction Techniques, Siggraph Computer Graphics 1983. Organizer of Panel Use and Value of Open 3D Standards at Medicine Meets Virtual Reality 13, Jan 29, 2005, Long Beach, California. 3D Computer Graphics on the World Wide Web from sandyr on Vimeo. 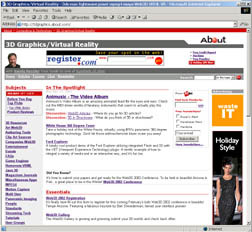 State of the Art for 3D on the Web, DVExpo 2001, Los Angeles, CA, December 4, 2001. VRML a Standard for 3D on the Internet, SigCAT '98 Baltimore, MD, May 19, 1998. Where do we go now?, Systems Anthropometry Workshop June 1997. If there are so many standards, why can't my avatar dance with yours?, Virtual Humans 97, June 1997. 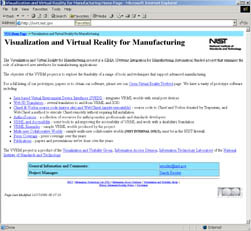 Real World Virtual Reality and Manufacturing, INFORMS Washington DC, Spring 96. Open Virtual Reality Testbed Activities, NASA workshop on Human-Computer Interaction and Virtual Environments Ahmed K. Noor (ed. ), NASA Conference Publication 3320, Nov. 1995. Approaches Using Virtual Environments with Mosaic (PDF) at the WWW94 conference Oct. 94. Open Systems and Virtual Reality: The Role of Standards in Creating a Market (PDF) at the VR93 Conference May 93. Open Systems and Virtual Reality (PDF) at the EFDPMA Virtual Reality Conference June 93. Applying Hypertext Technology to Standards Development, Dissemination and Implementation, at Standards & the Desktop, GCA, Boston MA, Nov. 16-18, 1988. Qiming Wang and Sandy Ressler, Translating IGRIP Workcells into VRML2, NISTIR 6076, National Institute of Standards and Technology, Sept.,97. Applying Virtual Environments to Manufacturing (HTML) (PDF) NISTIR 5343, Jan.,94. 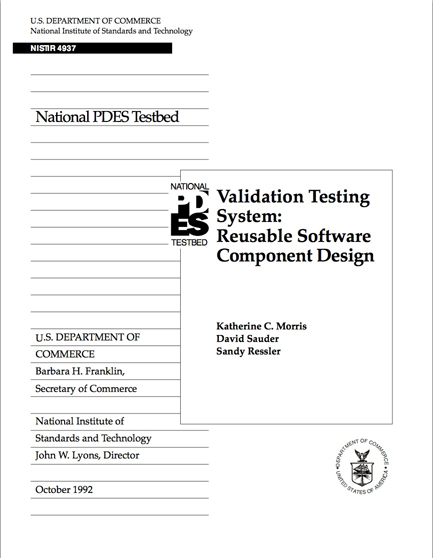 KC Morris, David Sauder and Sandy Ressler: "Validation Testing System Reusable Software Component Design," NISTIR 4937, National Institute of Standards and Technology, Gaithersburg, MD, 1992. 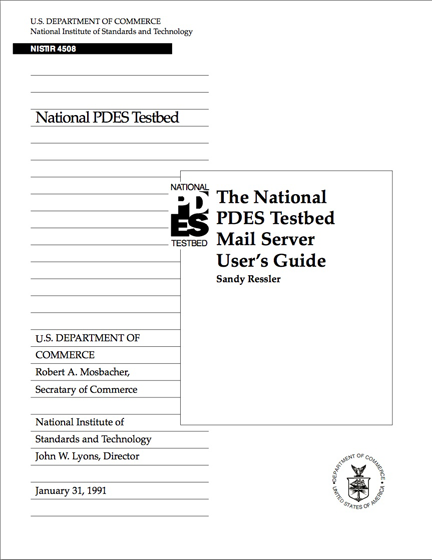 Sandy Ressler: "The National PDES Testbed Mail Server User's Guide," NISTIR 4508, National Institute of Standards and Technology, Gaithersburg, MD, 1991. 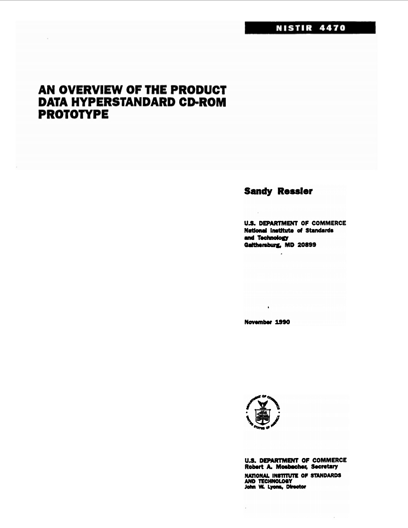 Sandy Ressler: "An Overview of the Product Data Hyperstandard CD-ROM Prototype," NISTIR 4470, National Institute of Standards and Technology, Gaithersburg, MD, 1990. 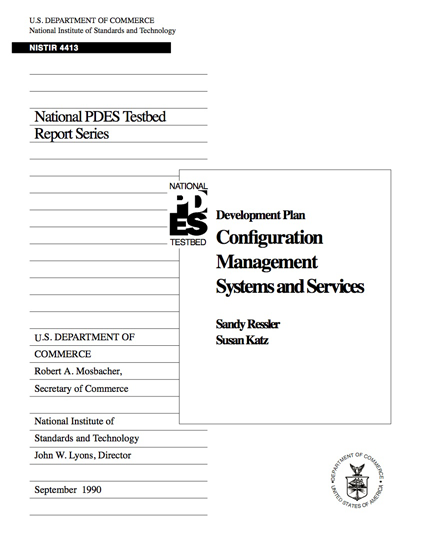 Sandy Ressler and Susan Katz: "Development Plan: Configuration Management Systems and Services," NISTIR 4413, National Institute of Standards and Technology, Gaithersburg, MD, 1990. Sandy Ressler: "The Hyperstandard: Applying Hypertext Technology to Standards Development, Dissemination and Implementation," NISTIR 3859, National Institute of Standards and Technology, Gaithersburg, MD, 1988. Y. T. Lee and Sandy Ressler: "Converting the AMRF Part Model Report to a PDES/STEP Subset," NBSIR 3818, National Bureau of Standards, Gaithersburg, MD, 1988. Sandy Ressler: "Using the AMRF Part Model Report," NBS Internal Report 3531, National Bureau of Standards, Gaithersburg, MD, 1987. Steve Clark and Sandy Ressler: "The Geometry Modeling System User's Guide," NBS Internal Report 3508, National Bureau of Standards, Gaithersburg, MD, 1986. S.P. Ressler, Sensitize: A Graphical Area Sensitization Facility, TM-81-11356-2, Jan. 28, 1981. CD-ROMs used to be a big deal, the HyperStandard was the first CD-ROM produced at NIST for an interactive collection of documents. It ran on UNIX, Windows and Macs. CD-ROM for book contains the entire contents of the book. Product Data HyperStandard prototype, Nov. 1990. 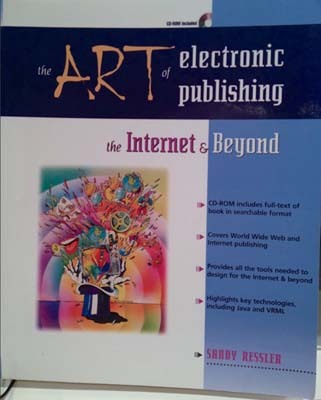 CD-ROM accompanying "The Art of Electronic Publishing" book, Prentice Hall, Nov. 1996. Articles for Bitcoin Magazine (both web and in print) and blog "Bitcoin in Plain English"
Independently developed course and multimedia (that was a hot term back then) interactive software document for a criminal justice application. Maryland Proactive Community Supervision "Break The Cycle" CD-ROM and Web site, 2001. An interactive CD-ROM with integrated animations and video for training. Web site contains all the content except for videos. Produced for the Bureau of Government Research, University of Maryland, College Park. "Twenty Years of Rutgers MFA's" at New Jersey State Museum of Art, April 82. Computer art film: Da Movies (video) and These Words Are the Data (video) at the Festival International de Jeune Cinema, in Hyeres France, June 80. Da Movies from sandyr on Vimeo. These Words Are the Data (html5 video) at Voorhees Museum, Rutgers University MFA show, April 80. These Words are the Data (excerpt) w/sound from sandyr on Vimeo. Dancing CAESAR Poser (2007) - an experiment integrating full body laser scan data, mocap and animation software. AT&T Archives: The UNIX Operating System (1981) - I produced the animations used in beginning to explain UNIX structure and dancing figures for end titles. Art Demo Reel 1975-1980 - animations produced while student at Rutgers and at Bell Labs. Fleeting fame on a few occasions. A web based tutorial on integrating a variety of technologies for compelling user experiences. 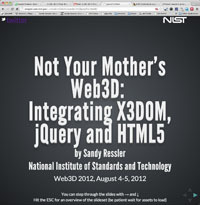 Internationally recognized site on the current state of Web3D. Author of a weekly article about VRML and Web3D since Oct. 1997 totalling over 150 articles. A leading government web site covering virtual reality and related NIST projects. An innovative 3D glossary for anthropometric names and their placement on the body using Web3D technology. 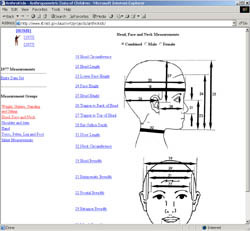 A unique resource containing the only anthropometric measurements of children even surveyed in the United States, made available here for the first time. 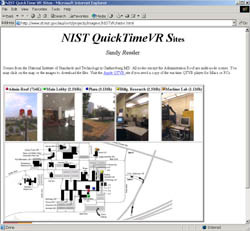 A variety of NIST sites illustrated using QuickTime VR's image based photography. ACM Distinguished Speaker from 2007 to present.